My first data profile has 3 dimensions; atom pattern (I think it is similar to frequency), time, and signal intensity. I can use supervised NMF for source separation straightforwardly. Because the atom pattern can be overlap, the first result is just acceptable. I can retrieve the second data profile as a Boolean vector. 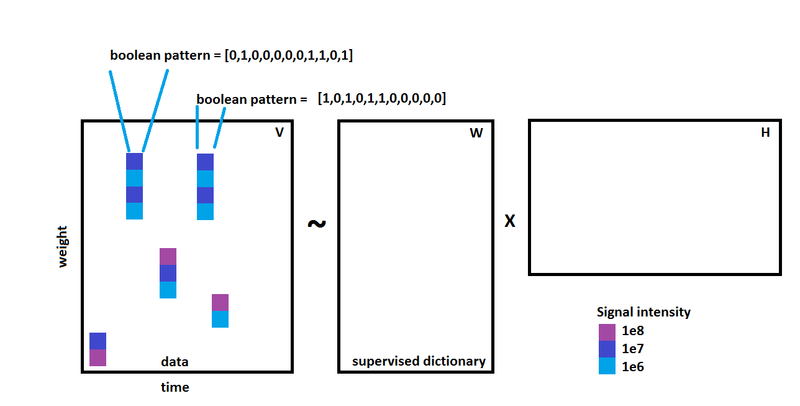 At specific time point, some atom pattern has another underlying pattern which can be describe with a Boolean vector. Are there some good ways to incorporate another dimension of information as a boolean vector into NMF model? I try to find a similar data in audio processing, but not yet found. Any reference or idea are greatly appreciate. Browse other questions tagged audio source-separation matrix-factorization or ask your own question. Non-negative matrix factorization for audio separation - why does it work? Can I start testing my NMF with extension on sample that have only one source?